Statue of Liberty and AMNH - Super Inky! 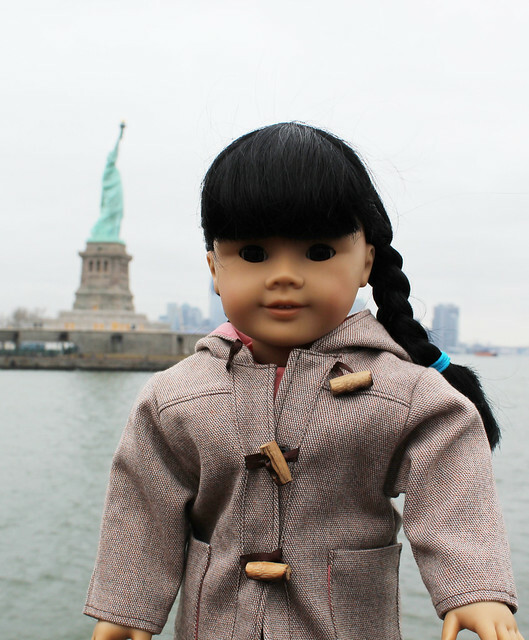 One of Katia's NYC wishes was to see the Statue of Liberty. To be honest, I rarely see it myself, so I was up for the trip too. We had to catch a ferry from Battery Park that took us all the way to Liberty Island. First of all, the security for the Statue of Liberty is airport style and as a result, the lines to get on the boat are super long. Second of all, it is freezing cold on a ferry in early March! Katia was so excited, even if she was the tiniest bit seasick. Doesn't she look pretty with Lady Liberty behind her? I tried to convince her to earn the Statue of Liberty Junior Ranger badge, but she didn't really want to. I'll have to try again on her next visit. While we were on the island, it was cold and windy. We didn't do much but shiver and eat chicken strips in the little restaurant. The ferry back was super cold too- after we got a few more photos, we rode inside the boat instead of on the top deck. 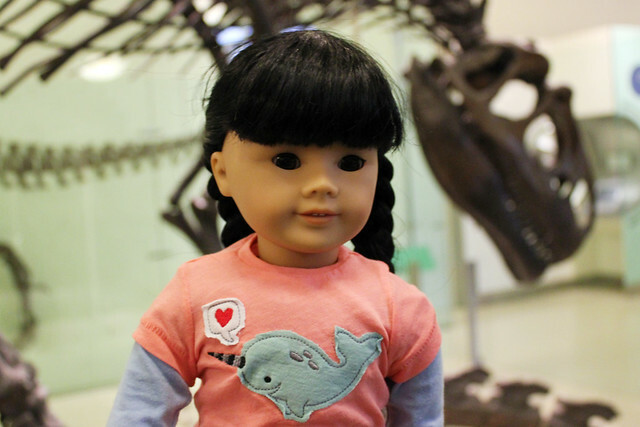 Once we got back on dry land, we took the train uptown to the American Museum of Natural History. 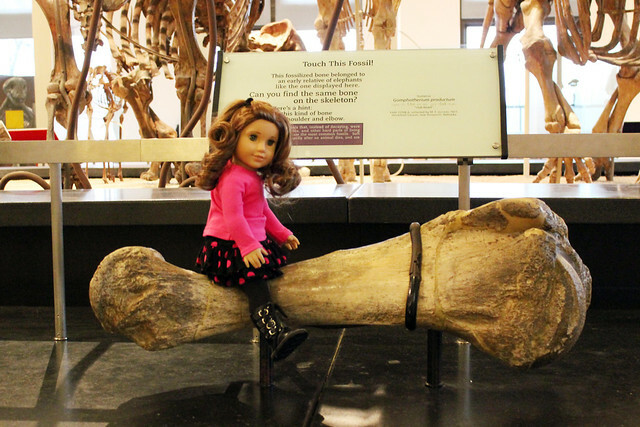 Katia wanted to see the dinosaur bones! Here she is sitting on one. Some of the dinosaurs were HUGE! But some were really small and cute. I love the museum. I hadn't gone in several months. My favorite part is the Hall of Human Origins. We didn't go there this time, but I did choose a Playmobil mammoth as my souvenir. It was nice having Katia visit- she and I could babble away in Russian for hours. She's been gone almost a month now though- I just haven't been very good about updating my blog. I'll write again soon- we have new neighbors down the hall and they have a daughter my age! Brr, visiting the Statue of Liberty in March doesn't look fun to me! Katia even looks like she's shivering in that photo, but at least she got the chance to wear her pretty Russian coat. I love your coat, too, especially with the way it buttons up. Those buttons are so cute! I think the Hall of Human Origins is my favorite part of the Natural History museum, too. I love looking at the intricate dioramas! Have you introduced yourself to the new neighbor yet? Don't be shy - everyone likes you! How could they not? You are the sweetest girl ever! 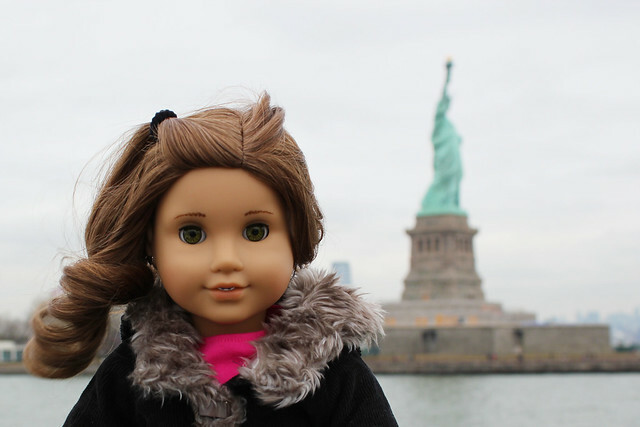 Amanda has been to the Statue of Liberty. It was extremely windy that day and her hair was flopping everywhere! You couldnt hear people talkin! I hope you and Katia have lots more fun adventures! Ary, Abri, Lora, and Lani. Hey, the Statue of Liberty looks fantastic behind you guys! The weather was cool, but I bet you made great memories. You should take some friends to Governor's Island! It's so quiet, it's the best! I love Katias style!I cannot WAIT to get my valentine! Recently me and my new sister Lyla visited the Lincoln Park Zoo in Chicago! We saw the most adorable red panda ever! I thought of you when I saw it! Inky where did you get your coat? My coat is custom-made for me by Dynamite Threads.